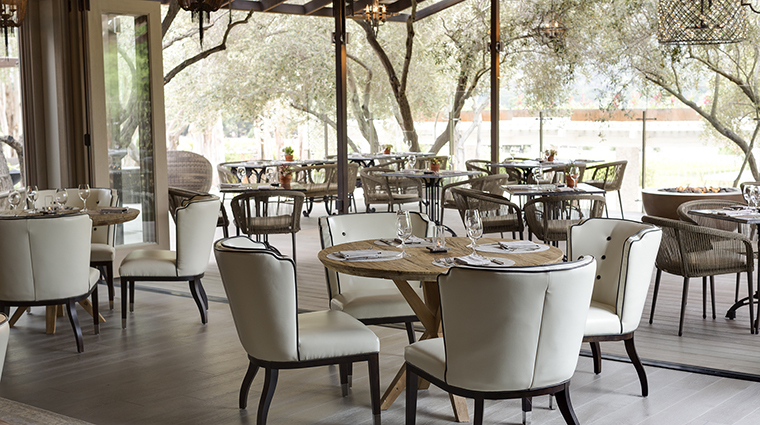 During the recent multimillion-dollar renovation, the two restaurants at Carmel Valley’s Bernardus Lodge merged and were reborn as Lucia Restaurant & Bar, an eclectic and elegant space serving breakfast, lunch, dinner and cocktails. The lilting name is inspired by the nearby majestic Santa Lucia Mountains. But Lucia also means “light” in Latin, and it’s an apt description for the airy space. From the natural illumination flooding through the expansive windows to the distinctive chandeliers and the pale oyster color scheme, Lucia just seems to glow. Here, you’ll feast on a French-accented seasonal menu that changes often. Step past a gleaming wine storage wall to arrive at the heart of Lucia. 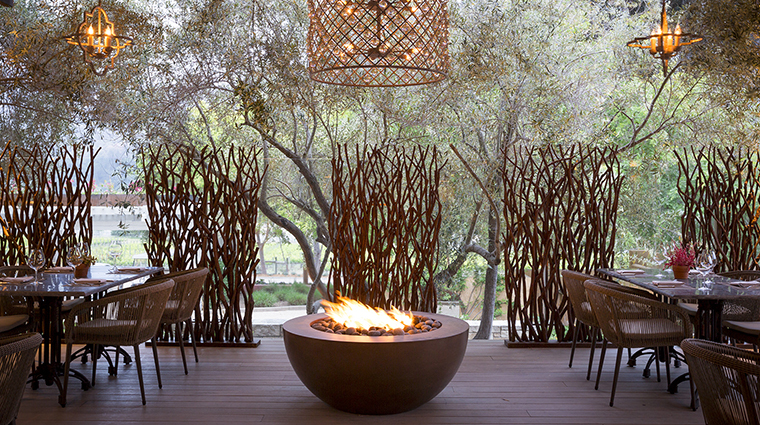 Whether you choose to dine at the beautiful communal table hewn from a massive tree, at a table overlooking the patio or in one of the intimate booths with metal mesh curtains, you’ll be offered a unique experience. 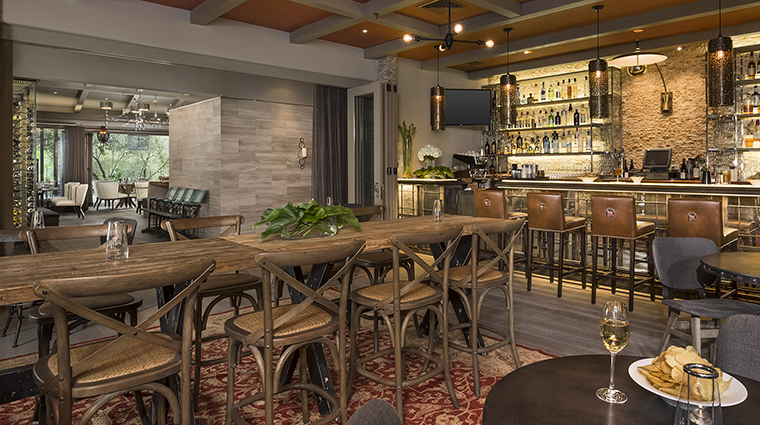 If you’re just looking for an afternoon libation, head to the far end of the space to the backlit bar serving everything from proper gin martinis to original creations with house-made syrups, herbs and trending spirits, such as mezcal and chartreuse. 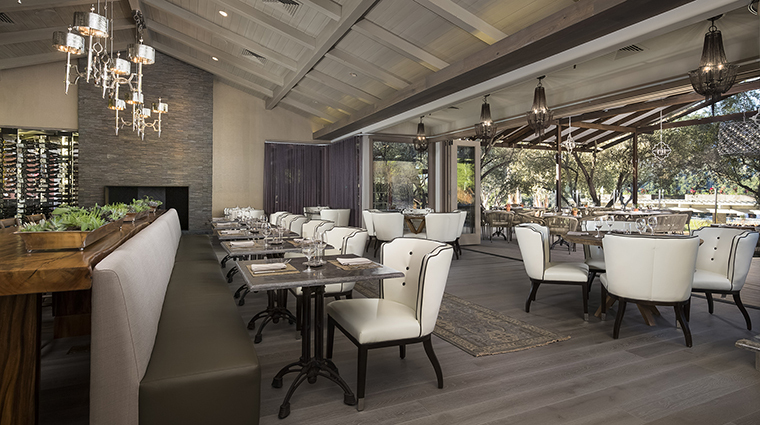 The 15,000 wine options at the Carmel Valley restaurant span Alsace and Austria, Napa and New Zealand, and is curated by Michael Marcy, Bernardus Lodge’s food and beverage director. 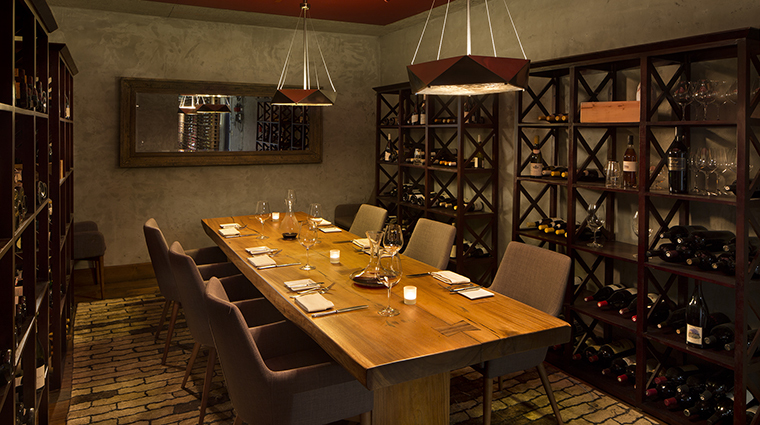 Wine lovers can reserve The Cellar, a private dining room for 10 guests that’s ringed by some of the most prized bottles in the resort’s collection. Though chef Cal Stamenov changes the dinner menu nightly, expect to dine on seasonal fare with a decidedly French flair. You can dine on Lucia’s seasonal cuisine any day of the week for breakfast, lunch and dinner. Weekend brunch is also served on Saturday and Sunday. 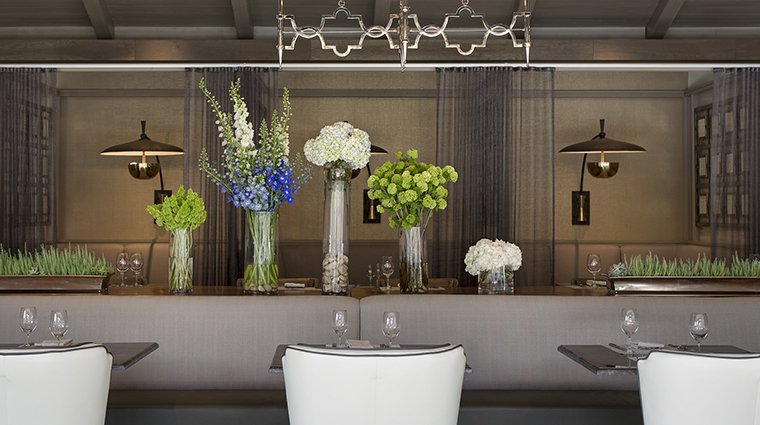 The Lucia Bar serves light fare and refreshing sips all day, beginning at 11 a.m.
Should you want to book your spot ahead of your visit to the Carmel Valley restaurant, simply visit the eatery's website to make a reservation or, if you’re a guest of the Bernardus Lodge, simply ask the concierge. The official dress code of the California eatery is resort casual, but if you’re planning on enjoying this fine dining feast for dinner, we recommend dressing it up a little bit. The marriage of European techniques with local ingredients is a beautiful thing, in dishes such as carbonara pasta with local abalone and bacon, duck rillettes lightened by peppery arugula or garden minestrone with black kale and squash grown on the property. If you have a taste for foie gras, you’ll be delighted by the duck burger with foie gras and a black truffle mustard or the traditional torchon, accompanied by buttery toasted brioche. Entrées range from lighter options such as dayboat scallops with a curried carrot puree and coconut milk or tuna with Greek olives, feta, tomatoes and a drizzle of local olive oil. More substantial selections may include duck cassoulet, a prime wagyu steak and the four-course tasting menu. Entertain your sweet tooth with delectable dishes like chocolate hazelnut mousse paired with salted caramel and honeycomb ice cream or a batch of cookies warm from the oven. 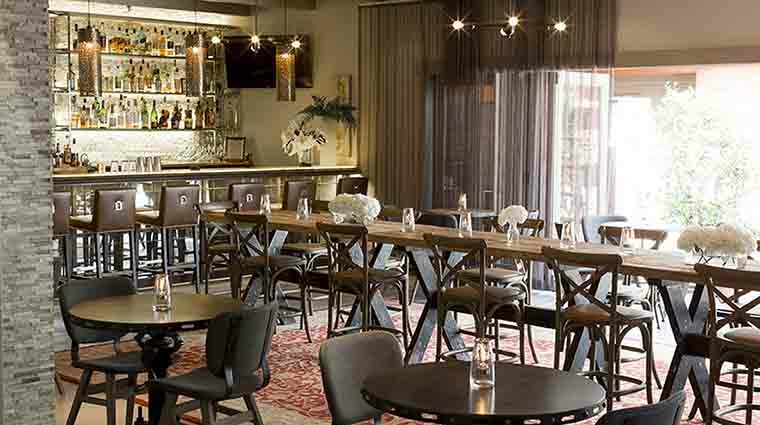 When you’re staying at a resort in the middle of wine country, it should come as no surprise that vino is the most celebrated beverage with 15,000 selections on offer. But if wine isn’t your preferred beverage, you’re sure to find something else at the bar, which is stocked with high-end brands and boutique spirits. Those spirits are mixed with fresh herbs and house-made ingredients for original cocktails like the Purritia, which combines mezcal with chartreuse and citrus or the Kentucky Waffle, a drink starring bourbon, maple syrup, vanilla and lemon.